Toughened glass is most frequently used in the rear and side windows of vehicles. It is designed to be much stronger than standard glass. In the case of a breakage, it shatters into very small blunt pieces thereby significantly reducing risk of injury. The toughening process introduces internal stresses into the glass through a combination of controlled heating to very high temperatures, (>640°C) and differential cooling. The heating cycle is also used to shape or curve the glass, either by allowing the heated glass to 'sag' to a pre-defined mould shape under gravity, or for more complex shapes, by being pressed to shape by male and female moulds. Lamination is a form of safety glazing where normally two thin glass plies create a sandwich around a polyvinylbutyral (PVB) interlayer. 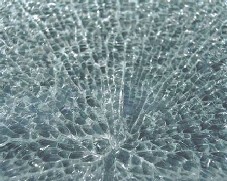 Normally used for a vehicle's windshield, in the case of breakage, the glass is held in place by the interlayer, retaining emergency visibility for the driver. Laminated glazing is now also increasingly being specified for car side windows. Usually the glass plies are shaped (curved) as matched pairs through heating to a temperature of around 620°C. As with tempering, the shape can be achieved through gravity 'sagging' or through pressbending for the more complex shapes. Differential heating to control temperature across the surface of the glass, and hence the resultant degree of bending, is also used for more complex shapes. The shaped glass pairs are then gradually cooled to room temperature before the PVB laminate is sandwiched between them. At this point the PVB is opaque and only becomes transparent at completion of the lamination process. This involves the removal of any air trapped in the glass sandwich through a mechanical or vacuum squeezing process, followed by the heating of the windshield to 140°C within an autoclave, under a pressure of 10 to 15 kg/cm2, to complete the bonding of the two glass plies.